Crystal Palace became the first club in top-flight history to lose their opening five games without scoring as Roy Hodgson's first match as manager ended in defeat by Southampton, say the BBC. The same Roy Hodgson who was parked up by the bins out the back of Waitrose in Richmond on Sunday afternoon, says me. 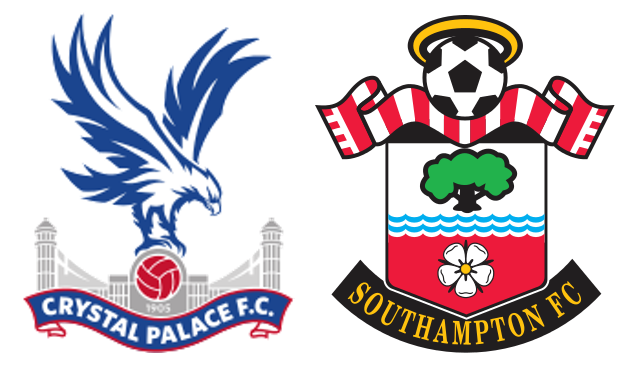 Palace v Saints, the easiest fixture of the season for me to get to, yet it was still panic stations for me to get there in time for an early kick off...kids eh. But with good company in tow, a pass for a few liveners afterwards safely tucked in my back pocket, spirits were high. The last time I watched saints play at Palace we won 3-1, the next day their manager was sacked and I had another daughter arrive into the world. As Palace had already dispensed with the services of De Boer earlier in the week, and the current Mrs S is without child, we only had a healthy away win left available to us, and whilst it wouldn’t prove to be as decisive from a goals perspective it was a solid enough performance and a relatively straight forward away win. Palace have had a wretched start to the ‘campaign', no points and no goals from 4 going into this game, but no doubt hoping for the much vaunted new manager up-turn in fortunes. History repeating itself perhaps from last season when Big Sam Allardice contrived to get his first win in charge against us. Saints on the other hand have been doing a more than passable impression under MoPe of the side that got Puel sacked last season. Goals as rare as hens teeth and a defence still deprived of the services of Virg, if for other reasons. I think it would have been a person of a staggeringly positive outlook looking for goals or excitement today. Palace needing points to stop them being another statistic, only Saints losing their first five games and surviving since football was invented by Sky Sports in 1992, they don’t have MLT. We miss the Eagle due to the taking of refreshments and the view we get from our seats is like a widescreen movie, we have a narrow strip of green and lots of roof to look at. Saints start well neat passing and all that and after 6 minutes goal machine Davis, in his 200th appearance side footed into the corner of the Palace goal with the defender on the line contriving to do a 'bit of a Lovren’ and it snuck in. Cue much jumping up and down and the hilarious chant of ’we’ve just seen a goal’ or some such. Batts who just wanted to 'see a fecking goal', gets his Palace bingo off to a great start…Long mis controlling the football soon follows as does Bertie looking a bit pissed off with Redmond, he now only needs Frase ignoring a speculative one from 25 yrds for a full house. Redmond is quite narrow allowing Bertie to move into aches of space should he feel so inclined, Tadic seemed to be hugging the touchline more but he and Cedric still linking up well, yet Tadic not looking up and picking the right ball on a couple of occasions having been instrumental the goal. Romeu and Mario Lemina bossing it like they’ve played together for years. Wesley and Yoshida having a relatively easy afternoon, the former dipping into his sweet repertoire of passing it long producing a couple of breathtaking passes. Redmond needlessly gave the ball away twice in quick succession resulting in a fine stop from everyones favourite Big Frase. It was textbook stuff from the wall, he’s great at this type of stop, close and reactive and it could have been a decisive save. Loftus Road Cheeks who is a massive unit, caused a few problems and had Frase scrambling with one effort in particular. Puncheon got a nice reception when he came over to take a corner, much lols as the old 'shits where he wants' song was dusted off. Interestingly, education based, fact fans, he went to the same school that my daughter goes to. All things considered a great half for Saints after last weeks horror show, and Palace being very obliging in letting us control things. Palace start well, pressing us and instantly it feels like this half would be more even. Fraser makes another great save early in the half after a rare misplaced pass from Romeu leads to a good old fashioned melee in the box. Could have been a bit different had that gone in but it proves to be the last real threat that i can remember, save for long balls in the mixer from Palace as the half draws to a close. Redmond and Tadić offer little if I’m honest, Redders making a hash of a chance created by a run of balance skill and strength by Lemina, who by now can do nothing wrong. The ball breaks to Redmond who will regret not taking it on first time instead of trying to ‘get it under’. He basically makes a fecking hash of it, which pretty much sums up his afternoon. We are not dominating play as we were in the first half, seemingly getting a bit anxious, and not retaining the ball like we were. Redders is put out of his misery and replaced by JWP, but the substitution that gets tongues wagging is the arrival of ex-captain and all round bollock wagon Virgil van Dijk, replacing the equally ineffectual Tadić to a mix of cheers and jeers. I’m unsure if he changed his agent over the course of the transfer window, it is however abundantly clear he hasn't changed his barber…this needs to happen soon as he's getting more bad advice in this dept too. Anyway, it feels kinda good to have him back, Yoshi who’s been awesome all day is suddenly marking his shadow and looks all at sea. Now I didn’t see the board go up with time to be added on, but I don’t remember the magic sponge making an appearance and there was no need to add time on for the inconvenience of a goal being scored either, so imaging our surprise when there was what felt like 15mins of added time. Long who is running about really fast and to be fair, winning a few balls he had no right to get, looks less likely to score the longer the game goes on. Considering he looked like he’d never score in a month of Sundays in the beginning, he’s eventually replaced by Gabbi, primarily to use up some time, which he has enough of to nearly get on the end of a cheeky free kick in the channel. Eventually the ref blows for full time to much relief from us Saints fans, well certainly me anyway. Looks like a long season for Palace fans, but they can get off to Richmond Waitrose to discuss things further with Uncle Roy should they want too. So whats the deal with Saints? Wesley and Lemina are utter class, they will have tougher days at the office than this, like this coming weekend for starters, but they look very very good indeed. The Black Box™ is definitely calibrated towards finding very, very good defensive players, it’s ability to find goal scorers not so much, the logarithms need tweaking to find the elusive No.10 we kinda need. Gaston, The Piratical nut case, now Boufal who continues to be under valued by another manager, meaning Davis is still key. Redmond who I usually enjoy was strangely off it and Tadić who had a 'big hand' in making the goal was equally quiet. It’s a good win and goes some way to balancing the books after the Watford fiasco. Frase reminded me and a few others I guess why he’s worth his place in the side. We have a great back 7 if you like, and Stephens and Yoshi will feel hard done by when they start warming the bench, but with Virg still possibly off in Jan, maybe not for long. Talking of which, Long is pretty pants and should never start ahead of Gabbi, we just need to ensure Gabbi isn't isolated. In general we will need a bit more from the lads up top, but it has been that way for a while. United will no doubt pull our collective pants down and do painful things to our bottoms, but by the time we get round to Stoke, Newcastle and West Brom we should be even stronger than we are now.